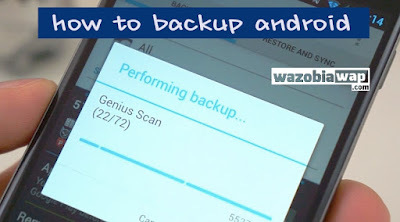 If you have so many files to backup on your Android device in order to keep them safe even when you hard reset your Android Smartphone. This tutorial will lead you on the basic and advanced ways to backup your files like photos, videos, audios, documents, Apps and even the entire Android system for Safety. 1. Using Google Photos - You can store or Backup as many videos and photos with Google Photos because it has an unlimited space. All you need to do is get a Google account. So you can download the app by clicking here. 2. Using Dropbox - With this, you will be able to backup Photos, Videos, Documents and Apps. It has the option to even backup pictures from the camera but it doesn't offer unlimited space like the Google photos. Although, you will be given 2GB space for free when signing up. Meanwhile, dropbox is compatible with all file types. It has a desktop application that will wirelessly allow you to backup files directly to your desktop or computer. You can get the app by clicking here. 3. Using OneDrive - Is similar to Dropbox but offer more space of 15GB when signing up. It also has a desktop application and OneDrive can be used to store Photos, Videos, Documents and Apps. Get the application by clicking here. 4. Using MEGA - It gives free 50GB storage and has a better security to keep your files. It can store Photos, Videos, Documents and Apps. Get the app by clicking here. 5. Using Google Musics - You can store up to 50,000 songs using this app for free. You can get the app by clicking here. 6. Using Google Drive - In order to keep your files like Photos, Videos, Documents and Apps, you will have to make use of Google drive even with its Google doc. It gives free 15GB of space for free. You can download it by clicking here. 7. ClockWorkMod - This will allow you backup the entire Android system like Boot, Recovery, System, preload, Data, and-sec, Cache, SD-ext, Medom and Efs. In order to make use of it, just boot into recovery mode and Select “Backup and Restore” then select “Backup” or “Backup to external sdcard” and follow the on-screen instructions to complete your backup. You can get the ROM manager by clicking here. 8. TWRP - This is also a custom recovery which has many features and can also perform task like ClockWorkMod. It can backup Boot, Recovery, System, Data and Cache. In order to make use of this app, just boot into recovery mode and select Backup then swipe to backup. Get the TWRP app by clicking here. 9. Titanium Backup - It can backup Apps, App Data, Data, SMS, MMS, Emails and Widgets. If you don't like booting into recovery process that means you will have to make use of this app to skip recovery process. Get it by clicking here. 10. My Backup - With this app, you can schedule your backup right to your SD card or internal memory storage and is very good. You can back up Apps, App Data, Data, SMS, MMS, Emails and Widgets. Get the app by clicking here. So with these basic and advanced method, you can choose the backup method that is suitable for your device.